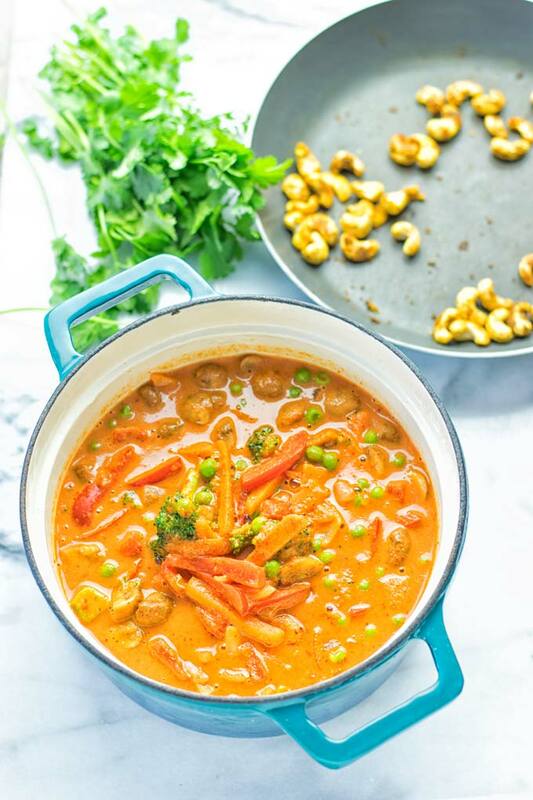 This amazingly satisfying Vegetable Panang Curry is super easy to make in one pot and naturally vegan, gluten free. Packed with fantastic flavors so satisfying and mesmerizingly good. Curries are always a thing for me and one of my go tos. I have some favorites like this Coconut Cream Pineapple Curry or the Lentil Chickpea Yellow Curry. But there are more, so feel free to browse around. The beauty of a dish like curry is that it’s super flexible. You can use whatever you want, go for your favorites. I used a mix of broccoli, mushrooms, peas, bell pepper, onions, and carrots for my vegetable mix. You can absolutely use what you like. Think of corn, zucchinis, eggplants, leek, or cauliflower. Anything will go amazing. Whenever you’ll made this, you’re going to try something new with different veggies. So it never gets boring or tiring for all of you. 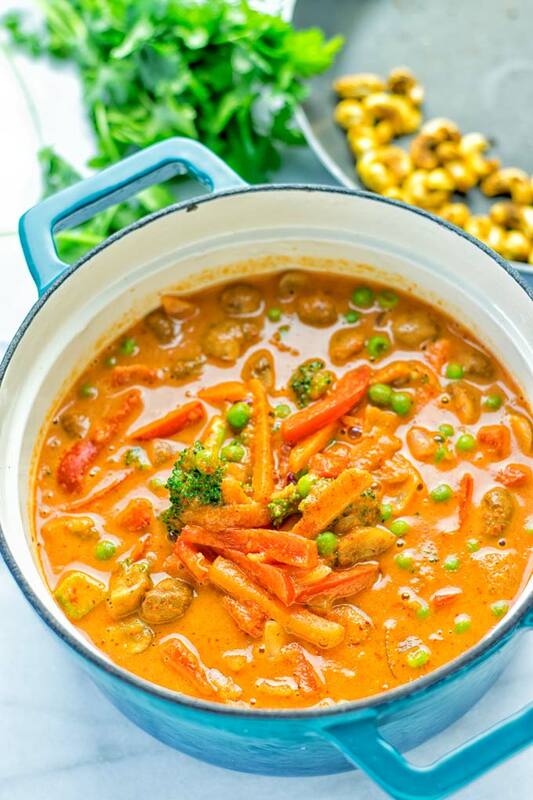 By now grab your favorite veggies and be excited for this Vegetable Panang Curry. It’s creamy, and incredibly satisfying with peanut butter. I mean who does not love peanut butter? See, right we’re all on board. The curry is perfectly spicy with the Panang curry paste. But better even, it’s super easy to make in one pot, perfect for meal prep, and budget friendly which makes this dish a winning combo for the whole family. 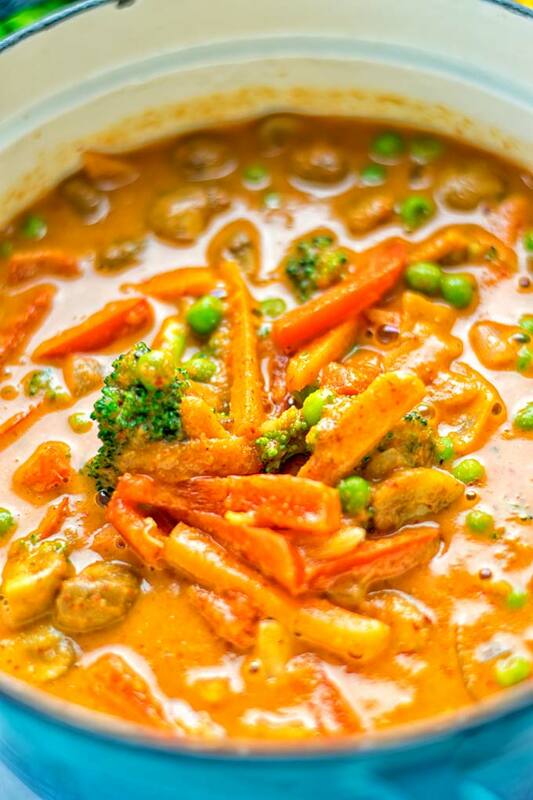 Panang curry is often made with meat and fish sauce. So it’s obviously not plant based or gluten free. 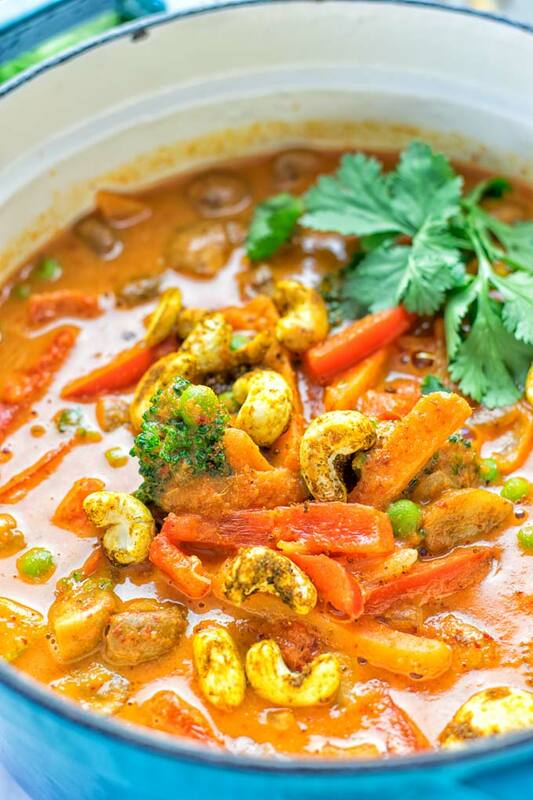 Often you find chicken, or beef in this type of curry, but barely seafood. That’s how to make Panang curry in a traditional way. Also it’s not common to use curry powder for any type of Panang curry. You really need and want a paste for the best flavor experience. 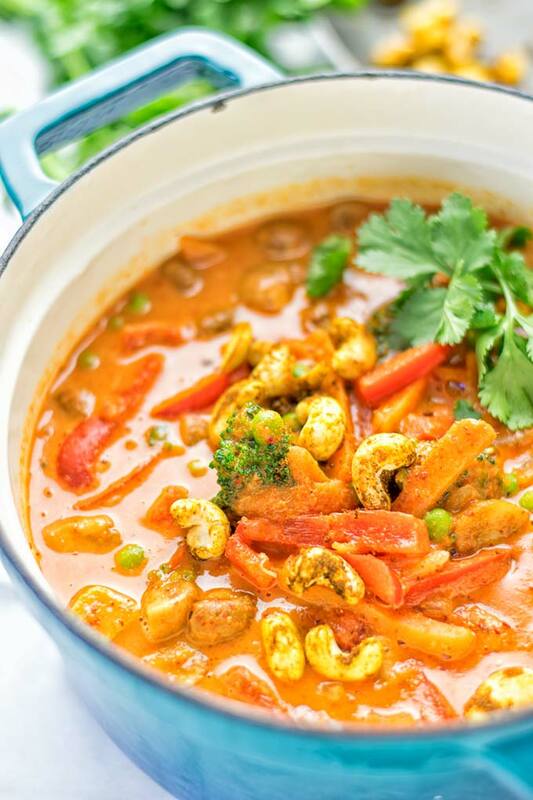 It’s creamier than other curries such as green or red from the addition of peanut butter and coconut milk. Most curries are made with coconut milk which is really rich, but adding peanut butter adds a new level of creaminess. Panang is also a bit milder and it’s a bit sweeter than other curries. That’s why you can add optionally a bit of maple if you like. I find it really compliments the other spices. But it’s totally up to you and just optional. I mentioned you can also go for red or green curry paste, but the flavor will be a bit different and also the color. It’s also delicious for sure, but I always recommend to get your hands on Panang curry paste to get the most delicious experience. Almost every store carries them. But if you find yourself finding a hard time to get it, try online definitely worth a try. Heat a bit of oil, or go for vegetable broth if you like to make it oil free. Add your veggie mix and garlic to that pot. Fry all for around 5 minutes. Next add coconut milk, peanut butter, and Panang curry paste. Season with salt and pepper, and cook for 8 minutes longer. After 6 minutes, it’s time to add the optional maple syrup, lemon juice, and tamari to that pot. Serve on plate or bowls with quinoa, rice, even potatoes, pasta or bread like this Easy Roasted Garlic Naan. There’s absolutely no need to, it’s so filling on it’s own. Note: If you plan to use the optional tandoori cashews, make them while the curry is cooking. 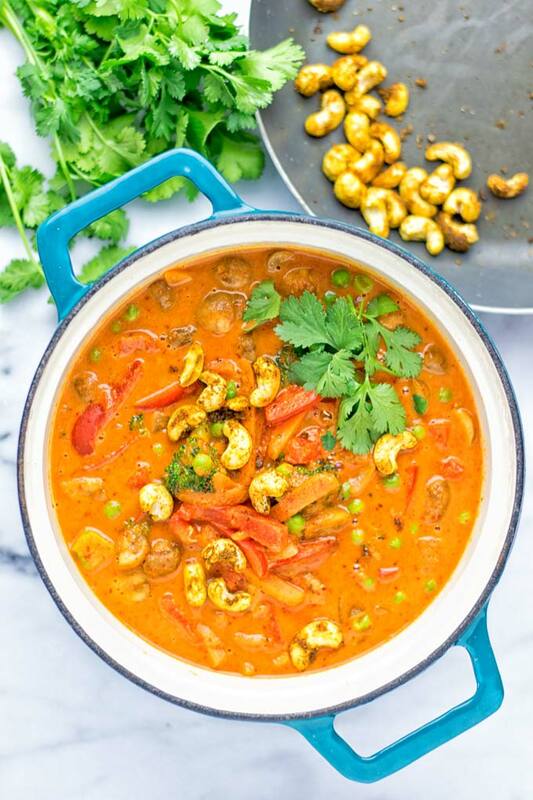 In a small bowl, mix cashews with tandoori spice. Heat a small pan and roast the cashews for around 3 minutes until lightly roasted. Be careful not to burn them. 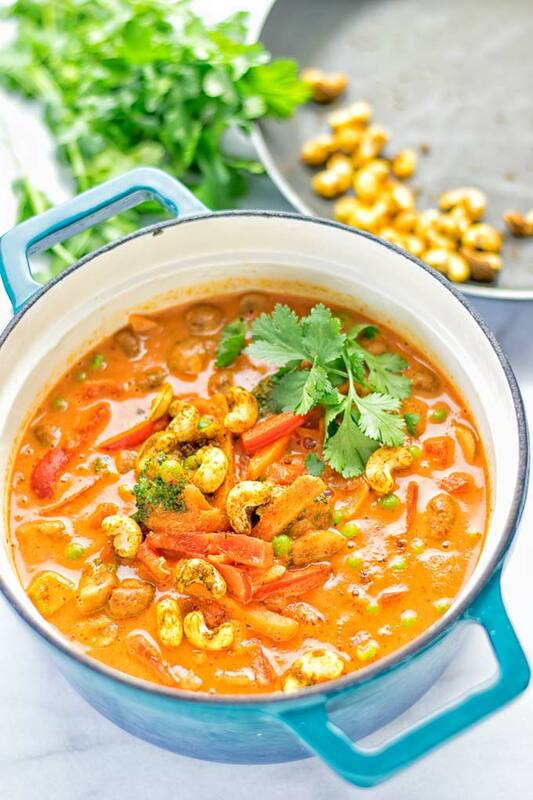 Garnish the Vegetable Panang Curry with tandoori cashews or mix in, just if you like. This makes an amazing and super easy to make dinner, lunch, meal prep, or an amazing dairy free option for work lunch. 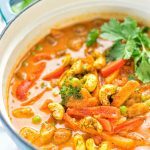 Of the fact that curry is super creamy and not to spicy, it’s absolutely delicious for the whole family. If you feel the need for more spiciness, you can always add more Panang curry taste. If you prefer it really mild, use less. If you give this a try, tag me on Instagram and Facebook with a picture so I can see all your delicious remakes. Next add coconut milk, peanut butter, and Panang curry paste. Season with salt and pepper, and cook for 8 minutes longer. After 6 minutes, it’s time to add the optional maple syrup, lemon juice, and tamari to that pot. Thanks so much for your excellent feedback! I hope you’ll find lots of more recipes to try!